Planning market research focus groups is a first step to gaining insight and knowledge about customers, prospects, and experts. Qualitative research is a marketing research tool, and is often a part of the marketing research process and marketing research plan. Almost anyone can conduct an interview with the right techniques and questions. Like most things in life, it takes knowledge, practice, and desire. And some good planning. Focus groups or depth interviews are tools of qualitative marketing research. Find out the importance of marketing research. There are two types of online focus groups: real-time and bulletin board. Learn how to use them to gain data, information, and insights. Internet marketing research offers new ways conduct qualitative marketing research. Here are 9 Internet research techniques you can use. Here are eight steps to design focus groups and depth interviews. Writing research objectives is the most important first step in a marketing research plan. Discover how to write objectives for focus groups and depth interviews. The focus group moderator guide keeps moderators on track. Learn the basics of writing a focus group or depth interview guide. A focus group screener is a brief survey that specifies characteristics of the respondents you want to interview and study. Here are tips on writing screeners. Focus group recruiting finds qualified respondents for qualitative research. Here are some tips on how to work with recruiters. The moderator has a major impact on the data produced in focus groups and depth interviews. Here’s a checklist for finding and selecting focus group moderators. Observing focus groups can get you new customer insight. Here’s a checklist to get the most out of watching focus groups and fostering insight development. Online focus groups research is growing. Here are 15 benefits of using the method. Professional focus group participants are widespread in consumer research. Here’s how to screen them out. 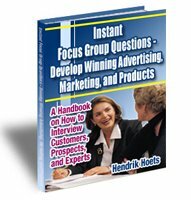 Instant Focus Group Questions e-book is a practical handbook about market research focus groups and depth interviews. It is packed with tips, techniques, and hundreds of questions. Click on the e-book to learn more now.